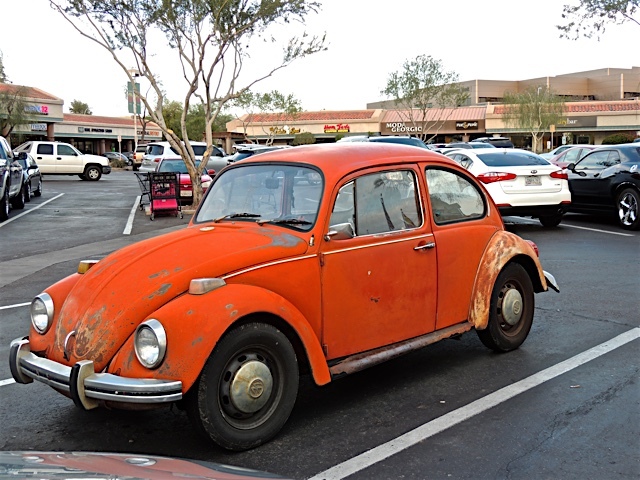 This old VW Bug looks a bit rusty and beat up but, it's still running and serving a purpose. I watched it drive up and park in the supermarket parking lot and couldn't resist a photo of it. I took this photo of an ultra-modern house back in December. 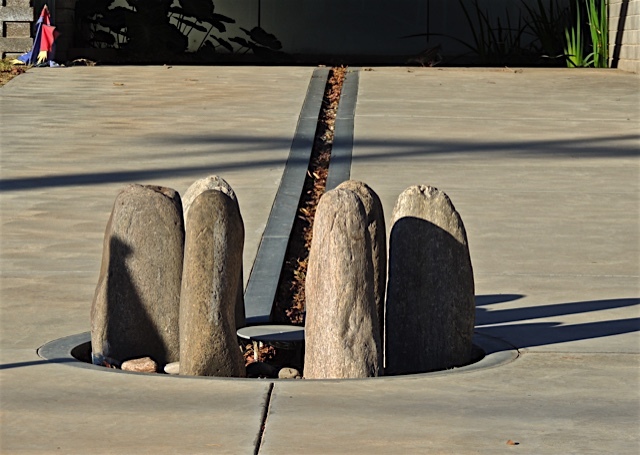 What caught my eye was that circle with the standing stones at the end of the sidewalk. What a strange artistic display. I'm not sure what it is supposed to represent. It's possible that it's some kind of fountain or maybe it's some type of lighting system. Whatever it is, it is highly unusual. When I visited the garden on Sunday, this fellow flew right over my head and landed in the tree right next to me. Then he proceeded to sing a rather happy tune. 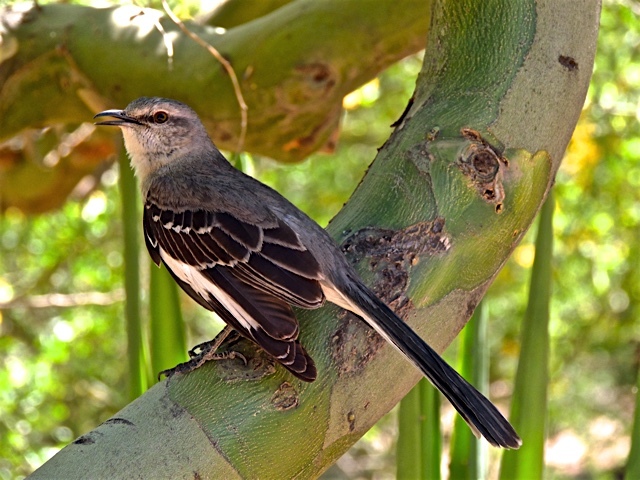 I looked it up in my Arizona Birds book and I think it's a Northern Mockingbird. I was just impressed at how friendly he seemed and not the least bit shy. 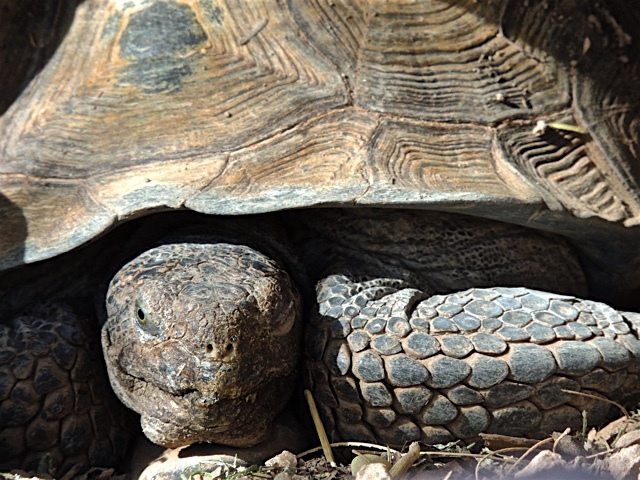 I took a short walk at the Desert Botanical Garden yesterday. Short because I didn't get there until around 2:00 PM and the afternoon sun was pretty intense. 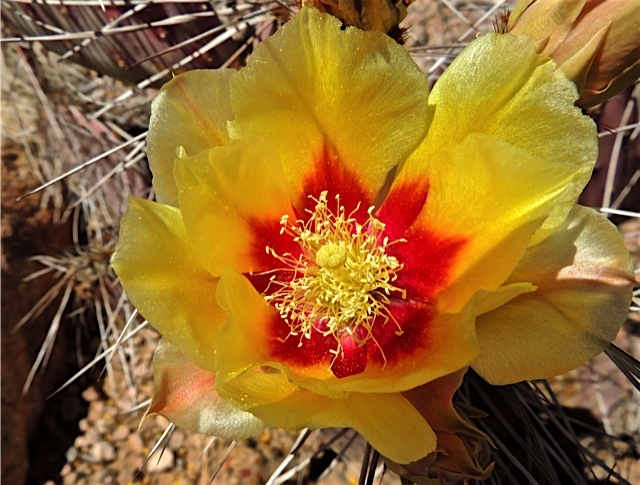 I was walking past a large bed of cactus when I spotted this one in the distance with the little yellow blooms on it. I was trying to make out the sign to see what it was and I had myself convinced that it said "Bongo Drums". Well, they sort of look like bongo drums, don't they? Maybe it's time for an eye exam. Anyway, it wasn't until I downloaded the photos that I saw what the name really is. 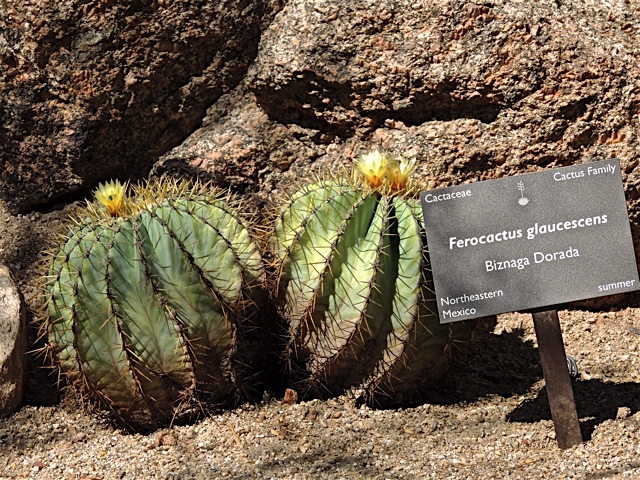 And, what an unusual name it is: Biznaga Dorada! 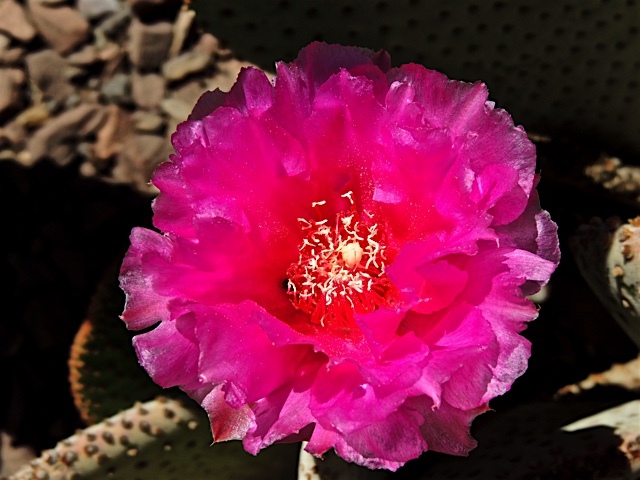 As you can see, there were plenty of cactus blooms to admire along the way. Next time I go it will be first thing in the morning before the sun becomes too brutal. Bongo Drums, I'm still chuckling over that one. 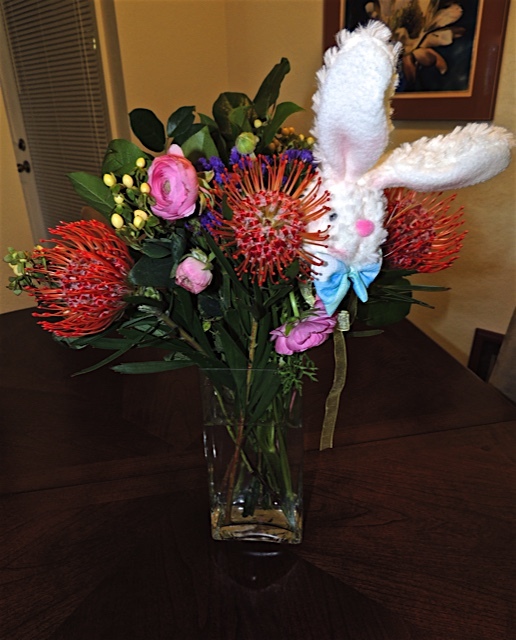 I picked up a bouquet of flowers for my dining room table and when I saw this cute little bunny I thought he'd be perfect for the season so I got him too. He looks very cozy tucked into the flowers. 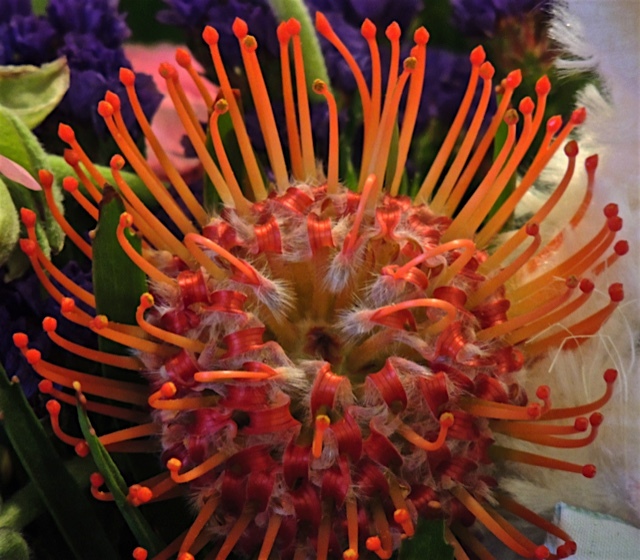 I'm not sure what kind of flower this is but I love the exotic look of it. Anyone out there know what it's called? I hope you are having a wonderful holiday! I have a new post on Sharon's Sojourns today. I'm visiting a Farmer's Market, Italian style. 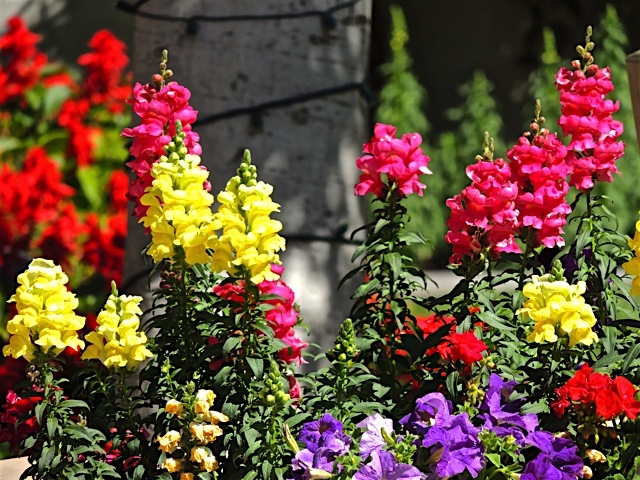 Bunches of spring flowers are showing up all around town. I found these at Biltmore Fashion Park on Friday. 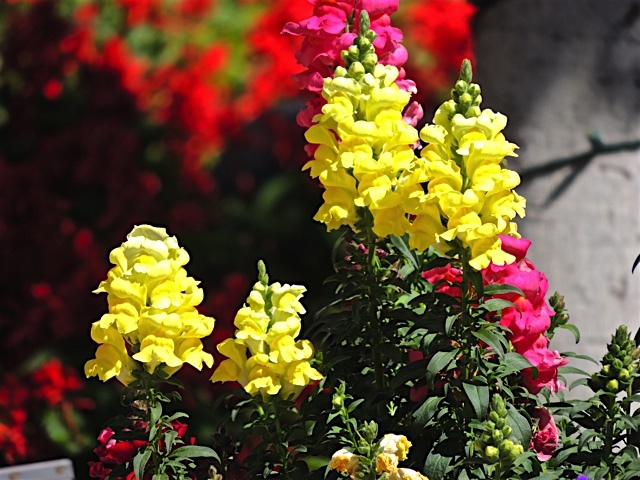 There were planters overflowing with these colorful blooms. 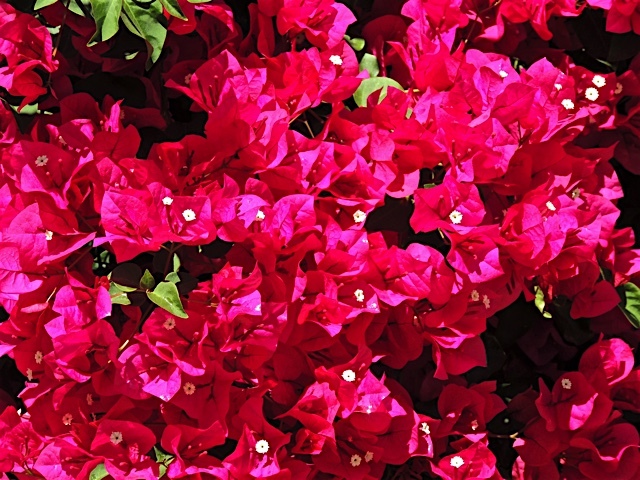 Even the extra hardy bougainvillea were putting on a showy display of red. ....Not the city in Morocco but, the cocktail lounge in Scottsdale. I've never been to this upstairs cocktail lounge but I hear there is a great view from the rooftop bar. 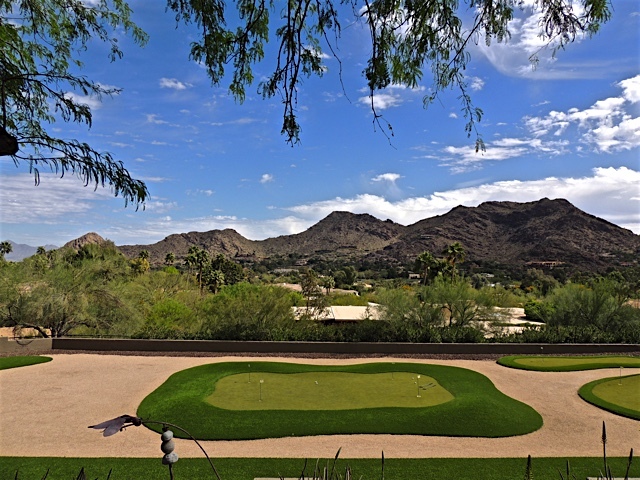 They are located in an ideal spot on the Scottsdale Waterfront and just a block away from Scottsdale Fashion Square. 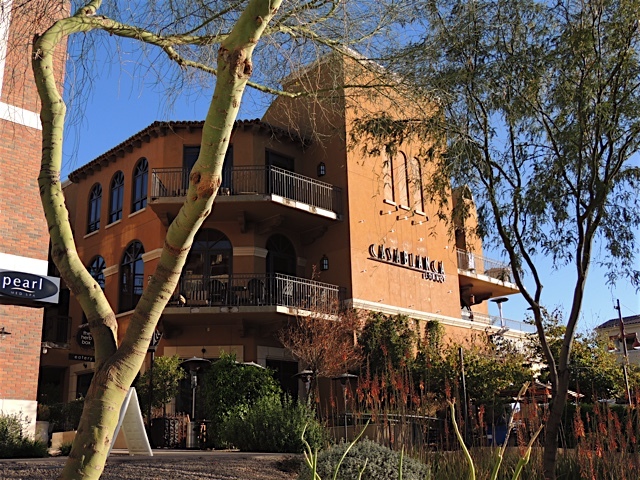 Added: A reader asked that I define Scottsdale Waterfront. There is a canal that runs through the area near Camelback Road and Scottsdale Road. That area has been used as a center point for shopping and dining in the area with lots of activities happening along the canal. 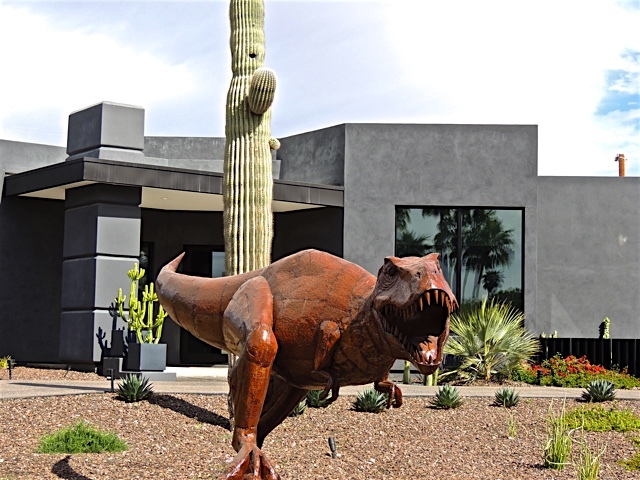 It's called the Scottsdale Waterfront. 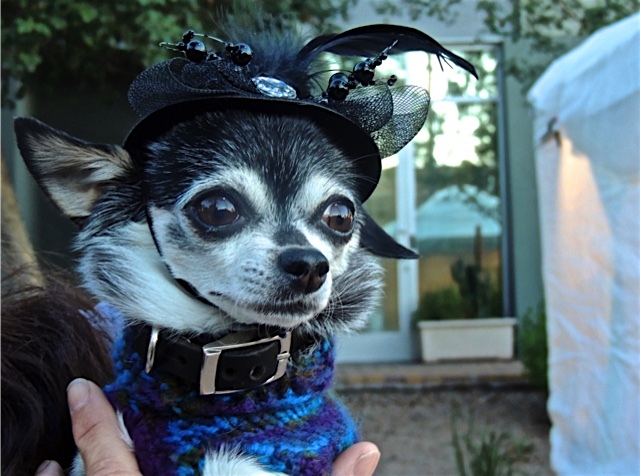 Meet Mitzi, a very fashionably attired Chihuahua. She was enjoying an afternoon walk with her owner along the Scottsdale waterfront. Love the hat Mitzi! 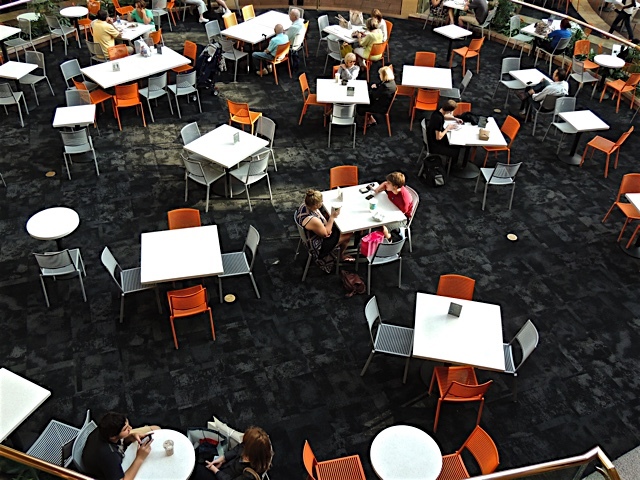 I was at the Scottsdale Fashion Square mall late in the afternoon and looking down on the almost empty food court, I liked the pattern of all those empty tables and chairs. At lunch time, it's almost impossible to find a seat. Last Sunday night I was in Tempe at the Grady Gammage Auditorium to see one of the plays in my Broadway series. 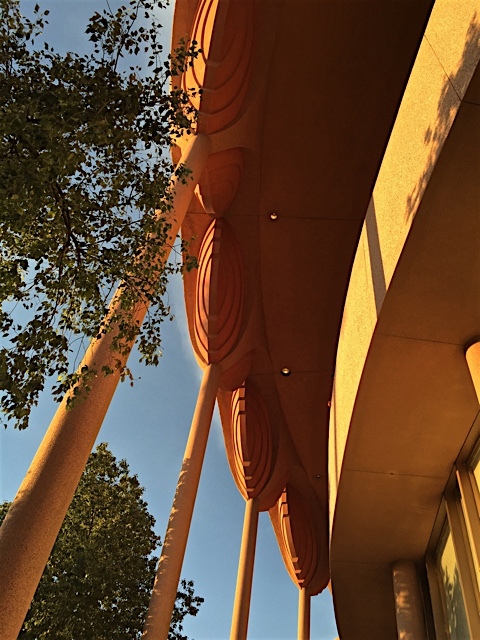 I was sitting on the theatre patio before the show with my friend Glenda and I noticed how pretty the sunlight on the scallop-like trim of this iconic building looked. I didn't have my camera with me but there is always the trusty iPhone. You might remember this building from other posts. It's the spectacular Frank Lloyd Wright designed building on the Tempe campus of ASU. 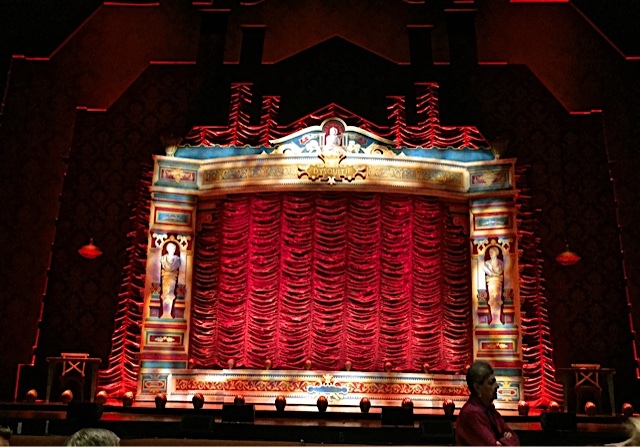 The show we saw was "Gentleman's Guide to Love and Murder" an uproariously funny comedy/musical that had the audience laughing and applauding all the way through. I had never seen this show before and I loved the stage setting so much I snapped a photo of it during intermission. All of the action of the play took place inside that frame. 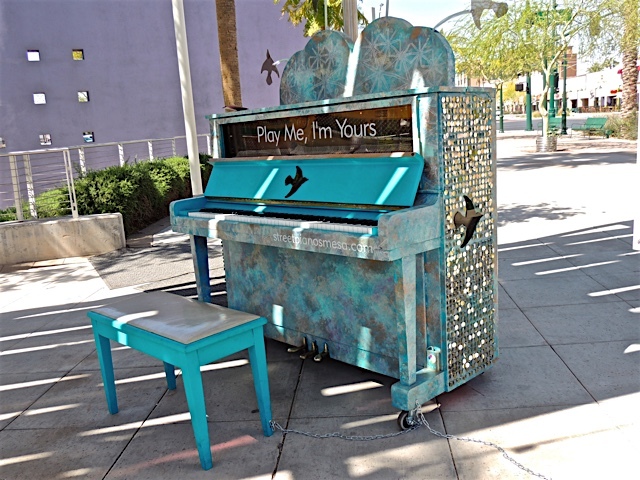 I didn't know that Mesa had a "street piano" project until I saw these two pianos at the Mesa Art Center last Friday. I like this one with its "Blue Willow" look. This one has a sky-like paint job complete with a soaring bird. The sparkles on the side are a nice way to catch the bright sunlight. While I was there looking at the interesting installations, there were several helicopters flying overhead and circling the area. 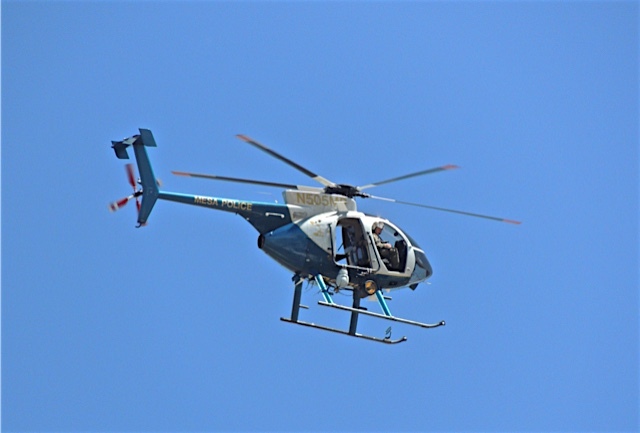 After hearing their roar for most of the time I was there, I finally turned my camera skyward and captured this shot of the Mesa Police helicopter. I'm not sure I'd enjoy flying around in this one with the open doors! 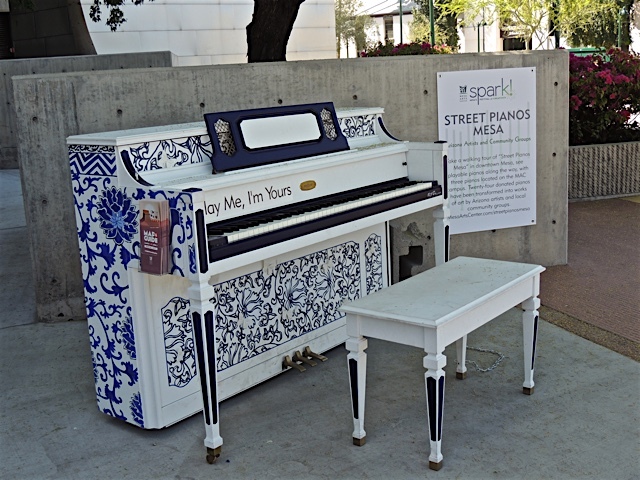 The Festival that was going on at the Mesa Art Center on Friday was called Spark, A Festival of Creativity. One of my favorite things I saw there was this installation called Many Hands Make Light Sound Work. You wave your hands over the place marked with the hand prints and lights come on at the top of the tubes and musical tones sound. It was just me and that youngster playing them when I was there so, I can only imagine how great they would sound with lots of people participating. 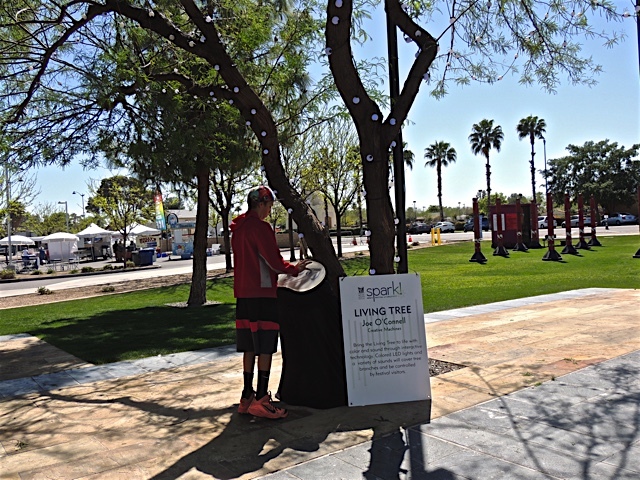 Right behind the sound poles was this tree all strung with lights and a sort of hand operated board where melodies play and the lights light up when different parts of the board are touched. This young man was demonstrating it for me. It really did sound like the tree was making music all by itself. Two very fun concepts that were very enjoyable to experience. I have a new post on Sharon's Sojourns today. It's a polo match in the true home of polo. 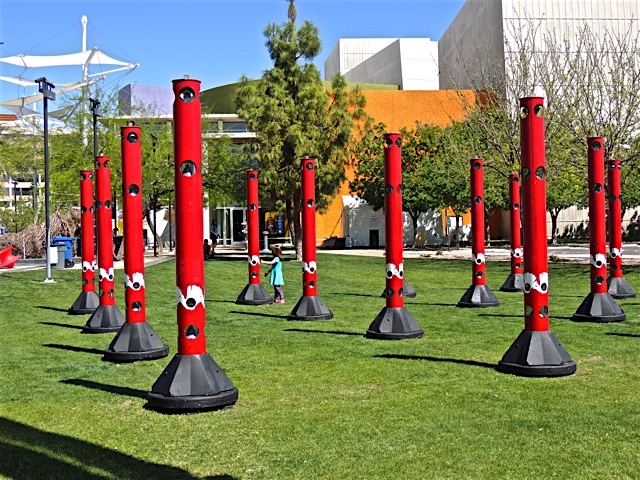 I heard a story on the radio on Thursday about an art installation that was going to be on display at the Mesa Art Center this weekend only and I thought it sounded interesting so I drove out to Mesa yesterday to see it. Unfortunately, it wasn't working and I hung around for an hour and half hoping they would get it going but by the time I had to leave it still wasn't operational. 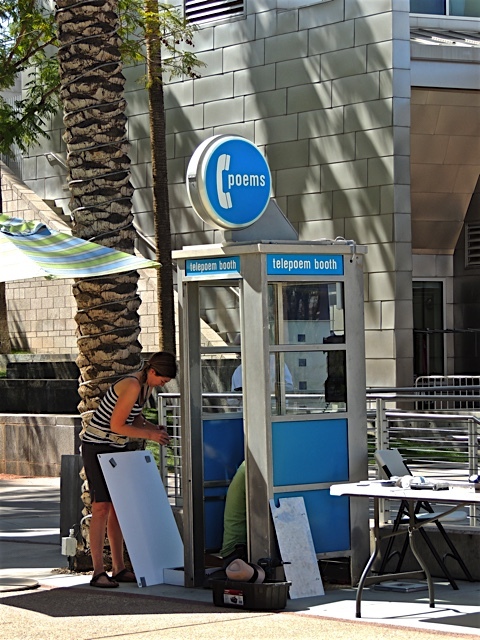 The artist has taken and old fashioned phone booth and repurposed it as a way for the users to get a bit of poetry. 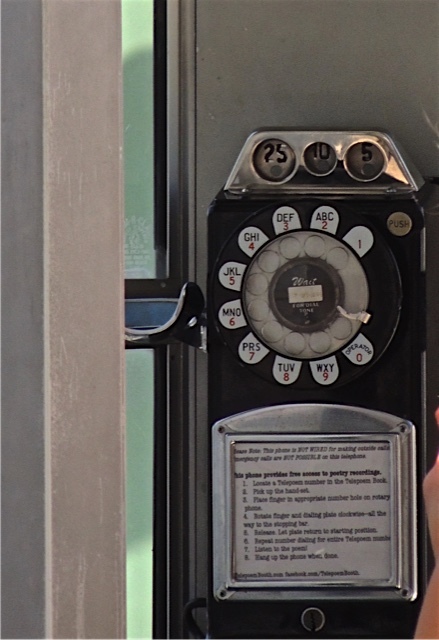 It was fitted with the old style "dial" telephone. 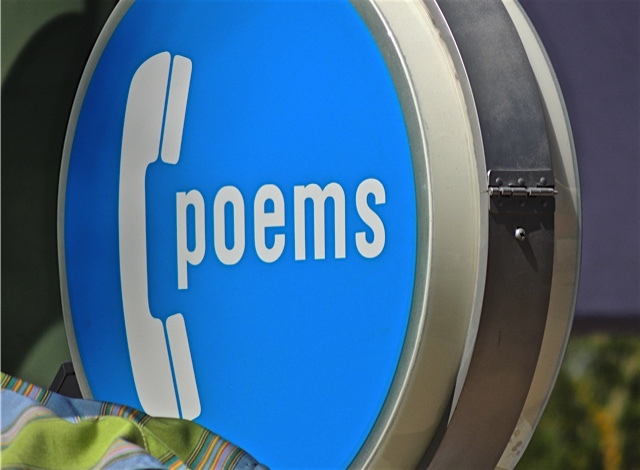 The way it's supposed to work is there is a menu of numbered poems that one might pick to listen to and when you dial the number, the poem is recited through the hand set. I loved the idea, I just wish I had gotten an opportunity to listen to one of the poems. Telepoem! It's a clever idea and I sure hope they got it working so people can enjoy it. 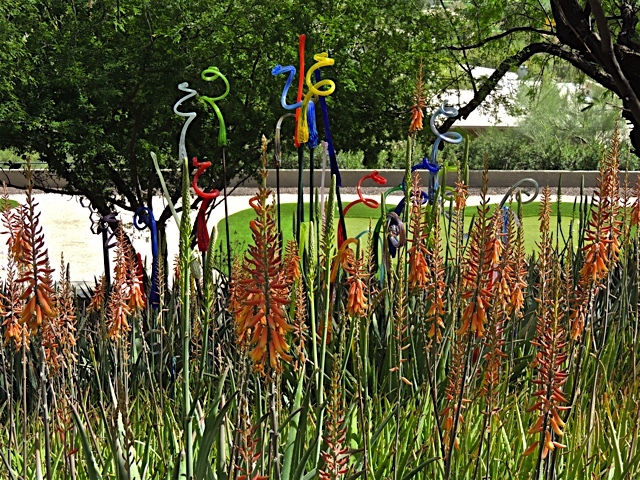 I didn't realize when I drove out to Mesa that a whole festival of art was going on there. So there was plenty for me to see and enjoy while I waited around. I'll show you more tomorrow. 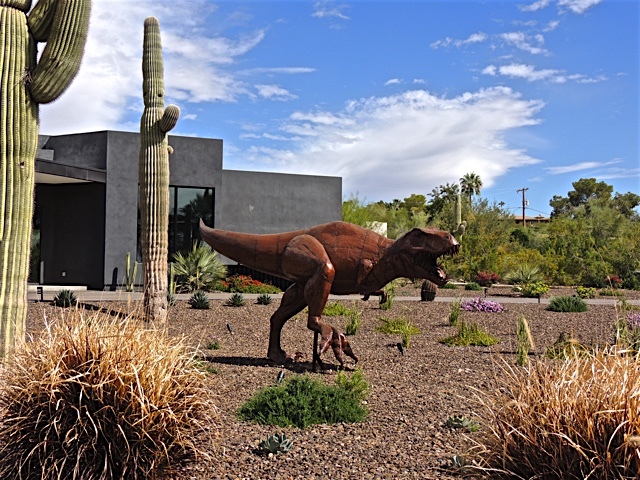 Imagine my surprise when I saw this big fellow heading toward me in an upscale neighborhood of Paradise Valley. The house behind him was for sale and was sitting empty at the time so maybe it's there as a sort of security warning. Sometimes yard art takes a strange turn. 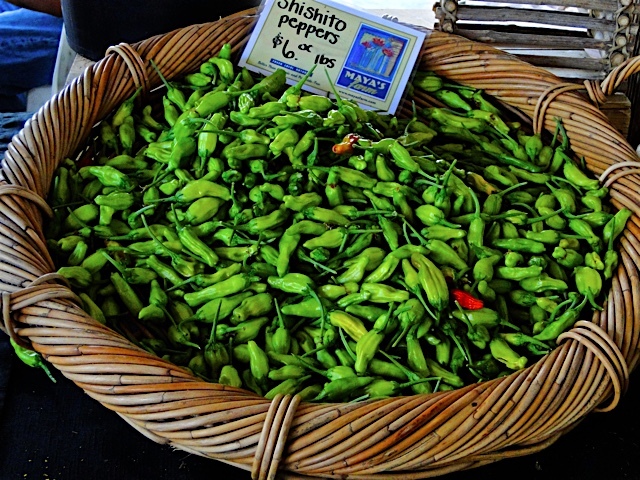 I went looking in my photo files for something green for a St. Patrick's day post and found this big basket of peppers. I don't think the Irish are big eaters of chili peppers but I know they love the color green so this will have to do. Have a great day! 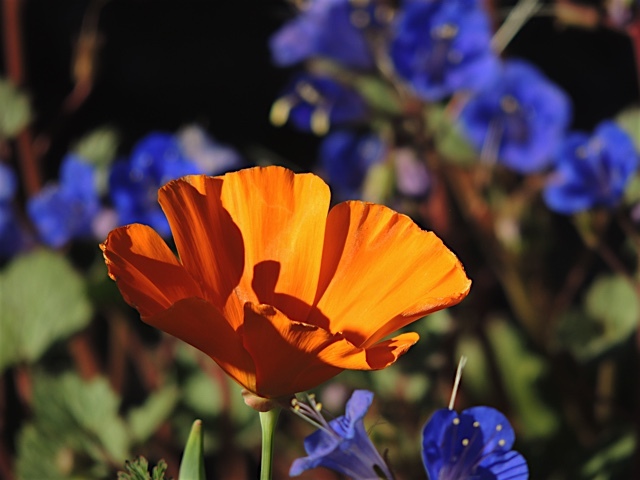 Poppies and other wildflowers are blooming like crazy right now in Arizona. It's a beautiful sight. 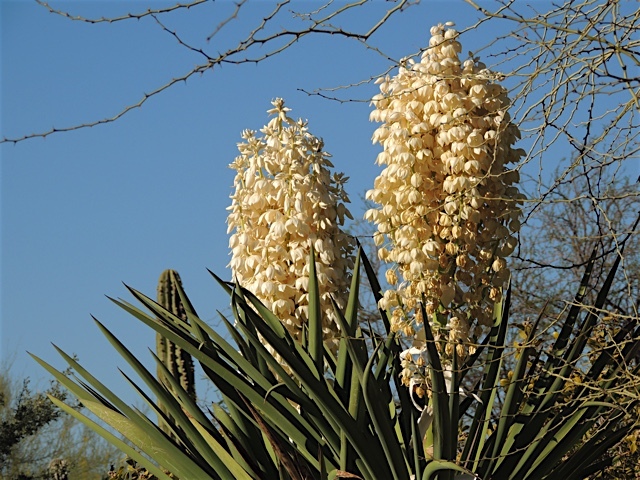 The Yucca are blooming too with their big, puffy looking blooms. 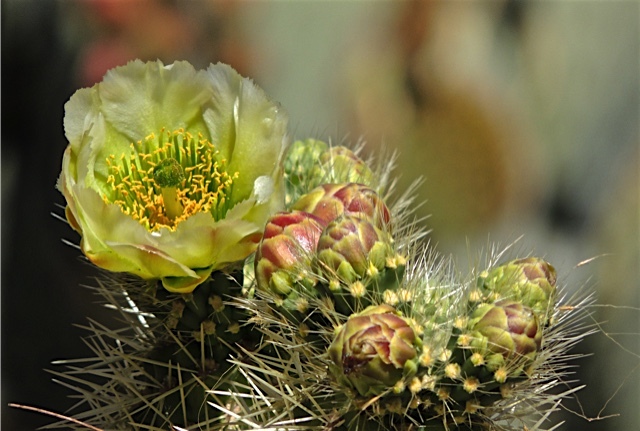 There is even a cactus or two with some bright blooms on them. 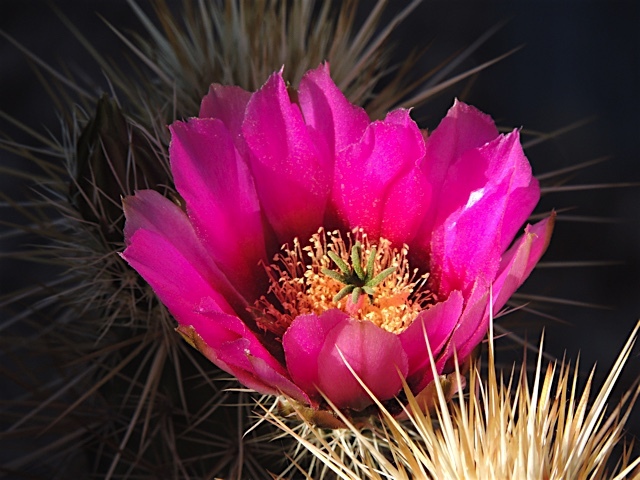 The desert is ready for spring. 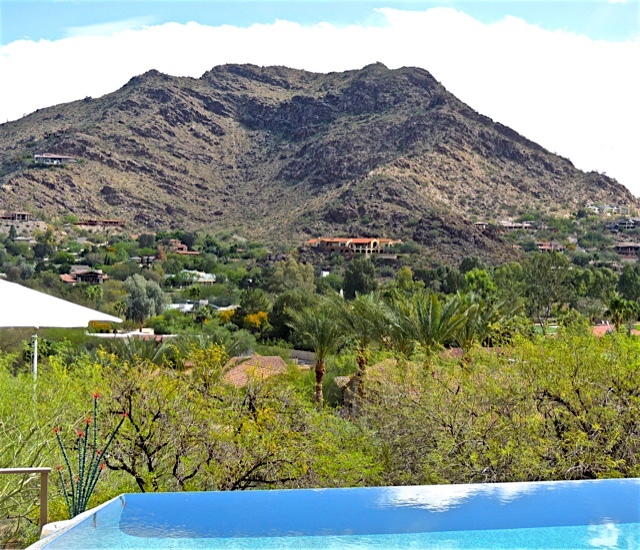 The third and last of the private garden's that Glenda and I toured took us into the mountains of Paradise Valley to a home perched on the side of the mountain with an eastern view. 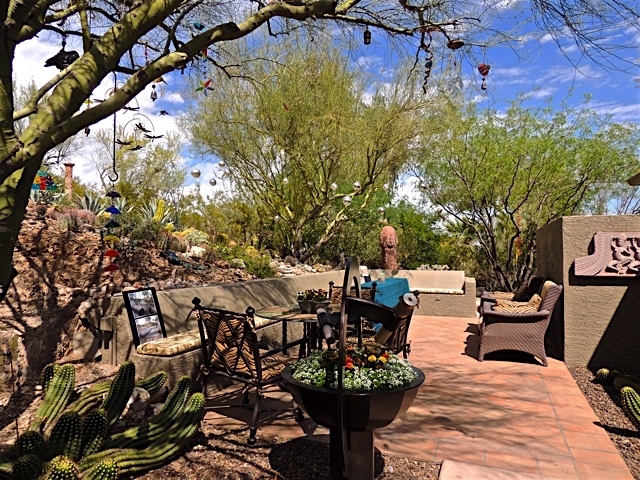 Above we see the front patio on the west side of the home and facing the mountain to the right. 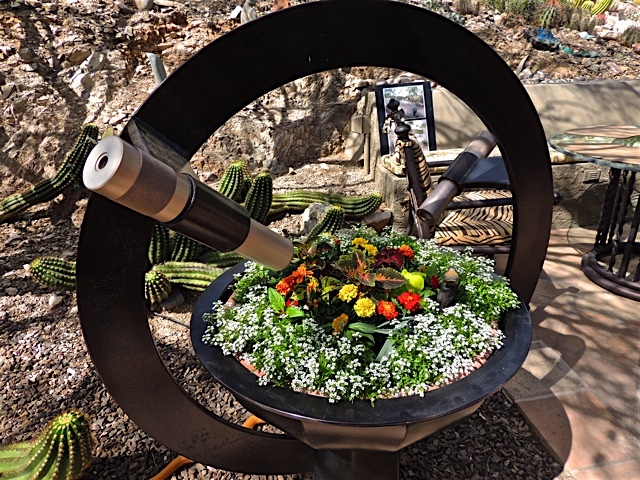 I enjoyed this planter on the patio with the built in kaleidoscope viewers looking down into the flowers. I took a peek into the viewer for a wonderful abstract view of those colorful flowers. 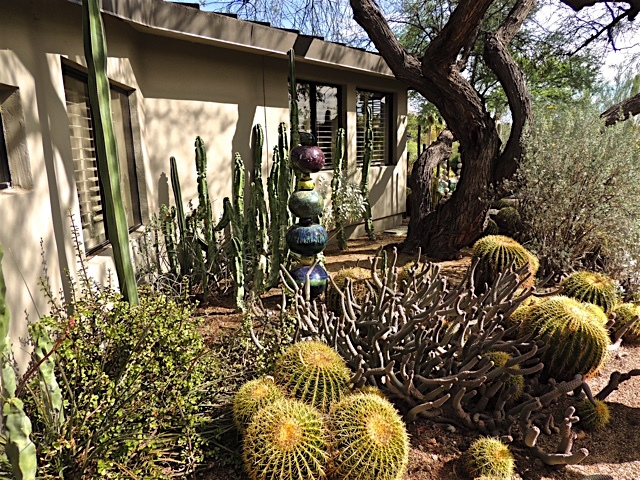 Walking around the path leading to east side of the house, I passed the patch of blooming aloe plants with a few glass ornaments scattered among the blooms. On the eastern side of the home and a little below the house itself was this great game area complete with several putting greens. 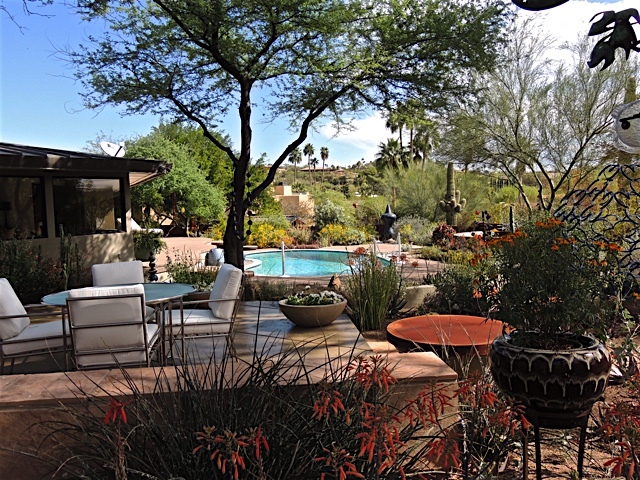 The views were fantastic from the vantage point of the back patio overlooking the infinity-edge pool. Glenda and I had a great time touring these fantastic gardens. We'll have to watch for this event next year and do it again. 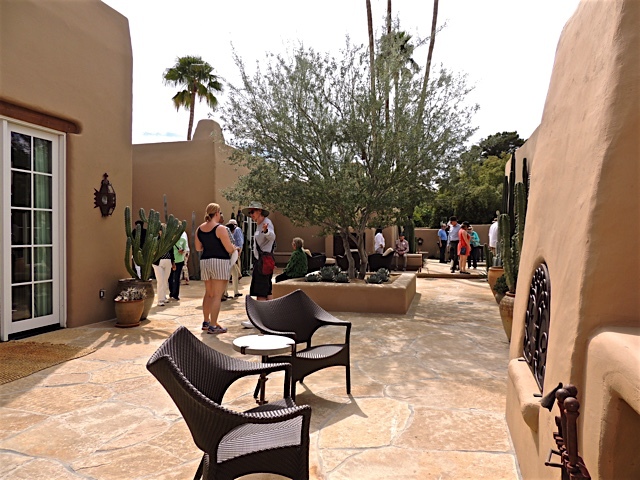 The second private garden that Glenda and I toured Sunday before last was at a wonderful pueblo style home with a fantastic desert landscape that is so lush, the house is almost hidden from sight. 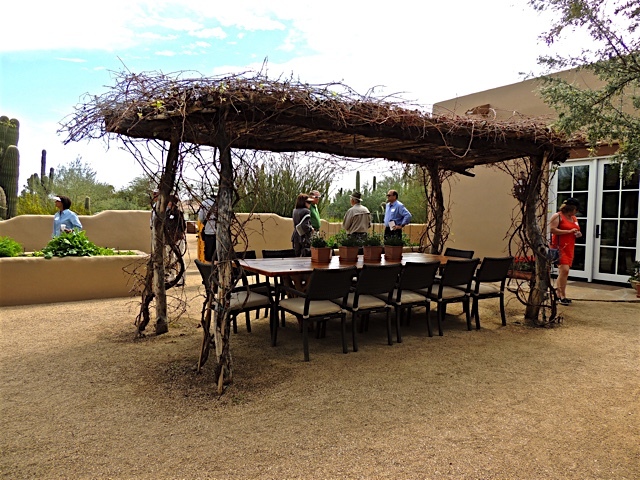 Off to one side of the home was this fantastic outdoor eating area shaded by a very rustic and very southwestern shelter covered in a vine. What a perfect place for a dinner party on those warm spring and fall nights. 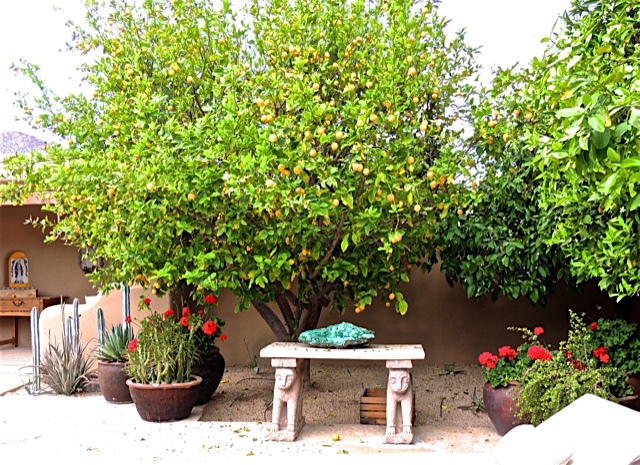 In the back of the house right next to the pool, were potted plants and several citrus trees. I loved that big hunk of turquoise rock sitting on the bench. There were two fireplaces in this back area of the yard but this one was my favorite. This looks like a perfect place to relax after a long day. 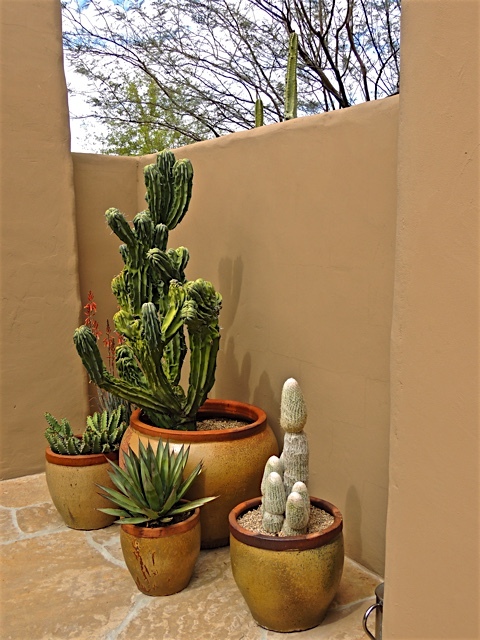 This back area of the yard was a perfect environment for growing all kinds of plants in colorful pots and containers. 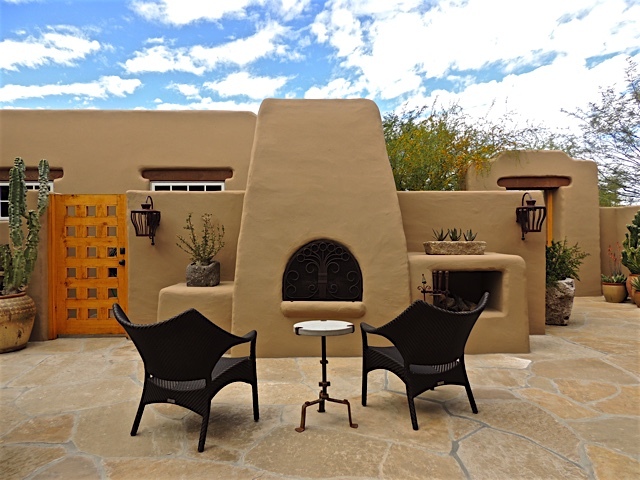 I love pueblo style homes so this one really appealed to me. Continuing on from yesterday's post, today I have some of the artwork that was found in the first private garden we visited last Sunday. 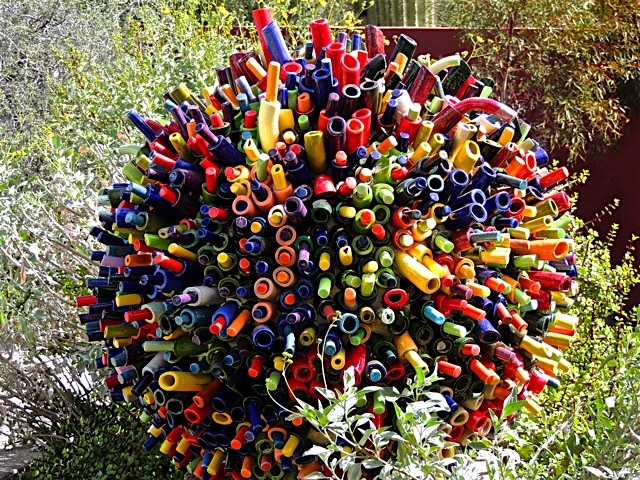 Above is a huge ball covered in bits and pieces of colorful ceramic. 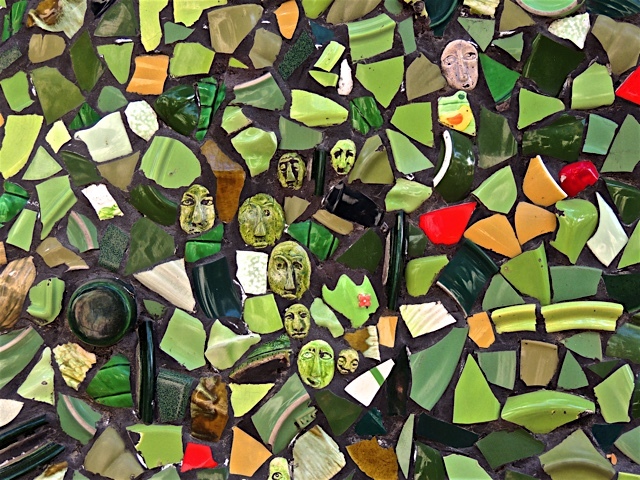 There were several walls covered in bits of pottery shards. 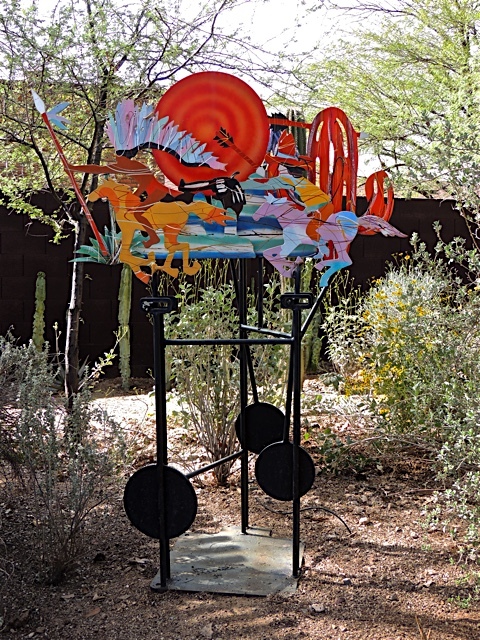 This mobile sculpture sat in a prominent position in the yard. I didn't see it moving but I can imagine those horse move back and forth. 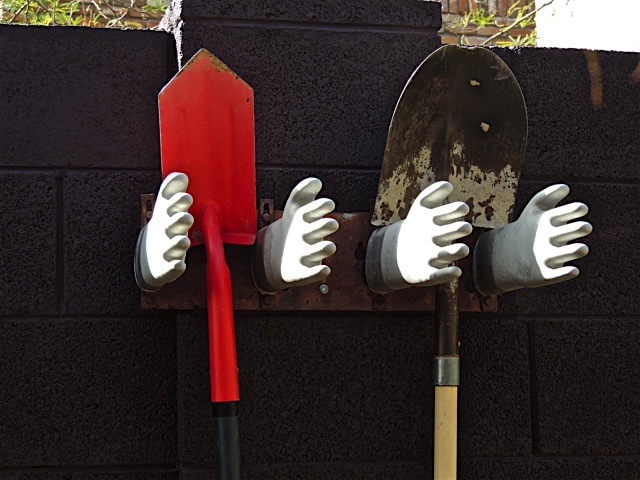 These ceramic hands were used to hold the garden tools in the back garden. 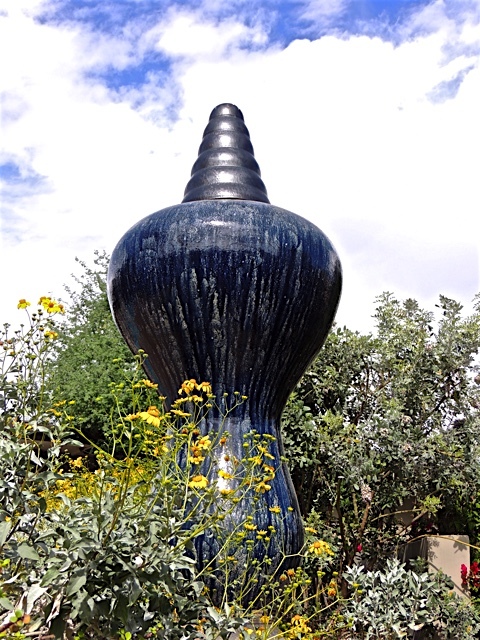 This very large ceramic pot also had a prominent position in the garden. All in all, I thoroughly enjoyed my stroll around this gorgeous and artistic garden. I have a new post on Sharon's Sojourns today. I have a peek at an unusual village discovered in the Hampstead area of London. 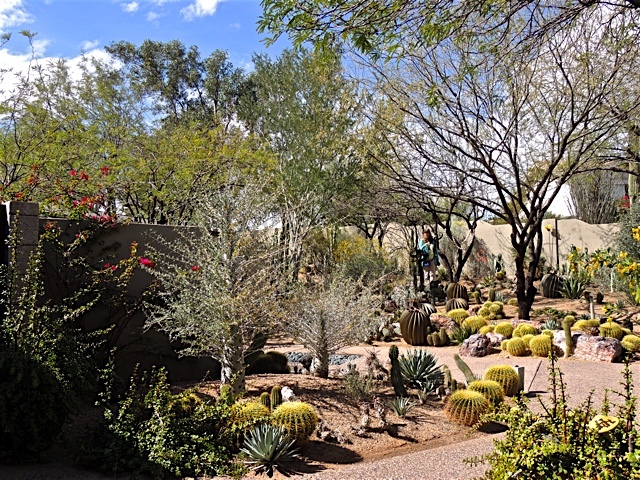 Last Sunday I joined my friend Glenda for a private garden tour that was sponsored by the Desert Botanical Garden. 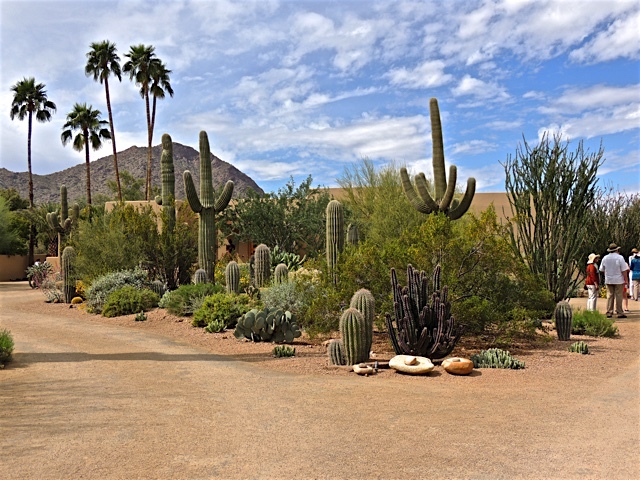 We visited the gardens of three houses all located in different parts of Paradise Valley. The first house we visited was owned by a ceramic artist whose work I've featured on this blog before. I've seen her fabulous ceramic totems at the Shemer Gallery. Click to link to see one of those posts. I took a lot of photos at this house because there was so much to see. 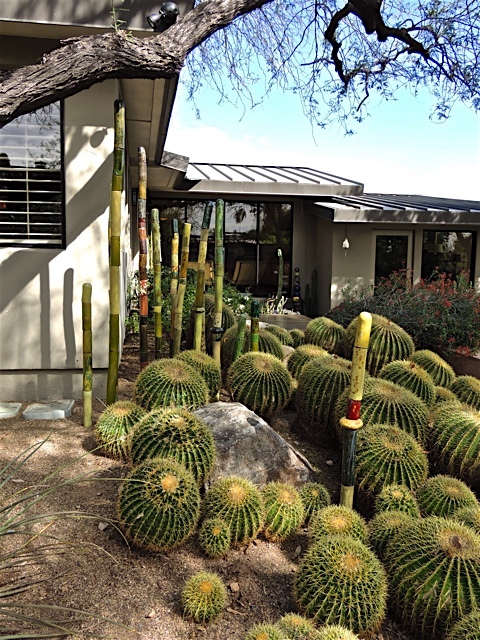 The yard was filled with all kinds of cactus and quite a lot of fabulous art work to go with it. 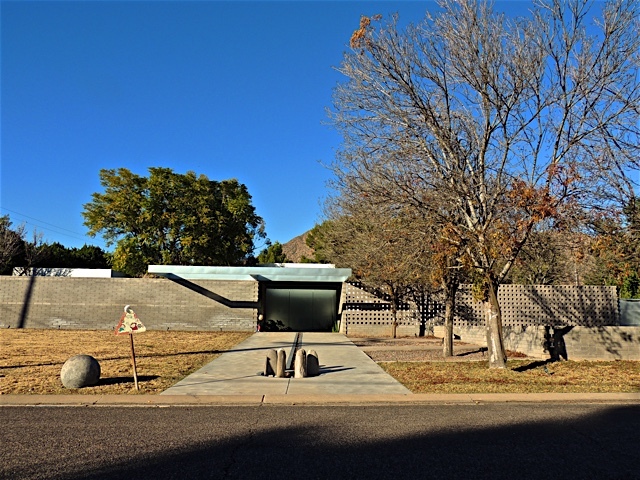 The house is located in the foothills so the lot has just a slight up and down feel to it. 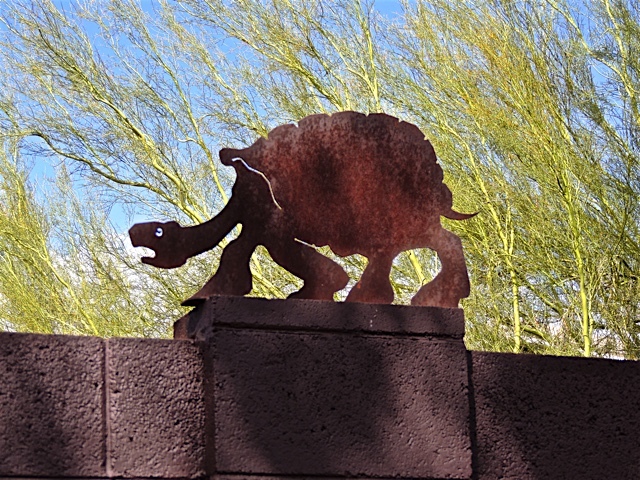 On one side of the yard, these rusty turtles were walking along the block wall. I think the iron turtles were keeping company with the real turtles who occupied one corner of the yard. Tomorrow I'll show you some of the art pieces that were in this gorgeous garden.